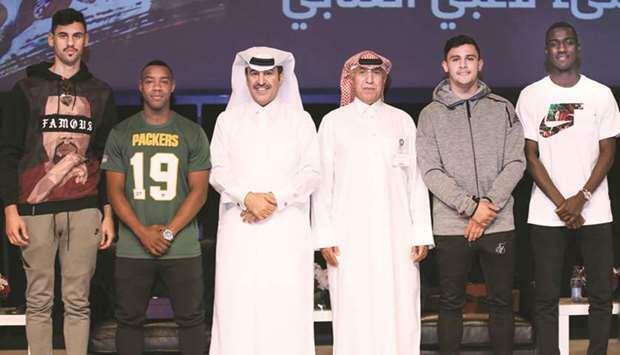 (MENAFN - Gulf Times) College of the North Atlantic-Qatar (CNA-Q) hosted a group of the country's football heroes and Asian Cup champions on campus yesterday. Al Annabi players Almoez Ali, Assim Madabo, Bassam al-Rawi and Yousef Hassan, spoke to a full house of nearly 1,000 of students and staff during a panel discussion session. In attendance were CNA-Q president Dr Khalifa al-Khalifa, vice president (finance and administration) Dr Salem al-Naemi, and associate vice president (student affairs) Aljazzi Fetais. The players took questions from the audience on a variety of topics, such as: how they feel during the game, how they balance sport and other life priorities, and what are some of their other favourite sports and activities? The players took a group picture with students and cut a special cake with president Dr al-Khalifa, before signing a backdrop that the college prepared in celebration of their historic achievement. The event was an excellent opportunity for the college community to show its pride for Qatar, in anticipation of FIFA 2022 World Cup. 'It was great pleasure to host Qatar's football heroes during their special appearance on our campus, said Dr al-Khalifa. 'Their words were inspiring and engaging. They are true role models for our students, to demonstrate that whatever your life's goal is, it can be achieved through dedication and hard work.